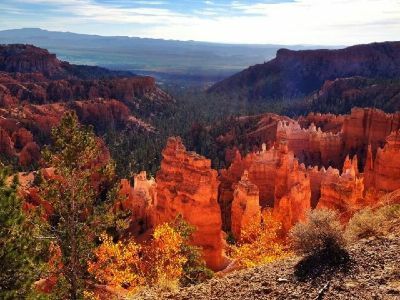 Read on to find the perfect trip from Las Vegas to Bryce Canyon National Park for your next adventure. After getting your fill of the lights, glitz and glamour of Las Vegas, you will be delighted to learn that the surrounding area offers the most iconic natural canyons, parks and rivers to visit. Join a tour that suits your time frame. We have 1 day to 7 days tours that take you to Bryce Canyon, Antelope Canyon, Zion National Park, Monument Valley, the famous Grand Canyon and more. You can camp under the stars or sleep in a comfortable hotel. You can choose to explore challenging hiking trails or simply relax and admire the astounding scenery. The first trip we recommend is a day trip from Las Vegas to Bryce Canyon. Your guide will collect you from your Las Vegas hotel and you will set off on a 4.5 hour journey in a comfortable air-conditioned minivan to the stunning Canyon. On the way, you will have a light snack and get to know your fellow travellers. On arrival, your first stop is at the Visitor’s Center where you will learn all about the geology of the Park. Follow your guide along the easy walking trails and stop at the scenic lookout points. You will be awed by the Canyon’s rim where you look down to see spectacular natural amphitheaters, Hoodoos, fins and windows created out of eroded colorful limestone rocks. Take some selfies at the iconic Inspiration Point, which offers three levels to view the astounding main amphitheater. This area is defined by bristlecone pines with gnarled and red hoodoos or thin rock spires. Then continue to Sunset Point, offering vistas of the Canyon’s most breathtaking Hoodoos. See the amazing rainbow colors of the Claron Formation and learn how this unique rock is composed of limestone deposited over 50 million years ago. If you want to explore deeper into the Canyon, your guide will advise you on more challenging hiking trails. The Las Vegas to Bryce Canyon stour spends around 3 hours in the Park and lunch is provided. After lunch you will head back to Las Vegas. Our next recommended tour is designed for a small group, ideal for a family or group of friends. The Las Vegas to Bryce Canyon And Zion National Parks Small-Group Tour takes 1 day. Your personal guide will collect you from your hotel and you will set off in a luxury SUV or minivan. Along the way, your guide will update you on the history, geology and features of these amazing natural landscapes. The first stop is at Bryce Canyon, famous for its horseshoe-shaped amphitheaters carved out along the eastern edge of the Paunsaugunt Plateau. Incredible limestone formations define the landscape in an array of colours, shapes and sizes with names like windows, fins and thin spires called Hoodoos. You will have the opportunity to walk amongst these formations to get a close up feel of this surreal landscape. Your next stop is Zion National Park, another awe-inspiring landscape filled with dramatic sculptured canyons and soaring cliffs. This region is home to a variety of fascinating plants and animals. Admire the views from the lookout points and take snapshots of the high plateaus, the maze of narrow, sandstone canyons and imposing rock towers. The Las Vegas to Bryce Canyon tour stops at Kolob Arch, the world's largest arch, a highlight of the trip. Lunch is provided and after a full day of exploring you will return to Las Vegas. Experience the beauty of the natural landscapes around Las Vegas on our combo Las Vegas to Bryce Canyon and Zion Combo Tour. Please note that the tour only operates May 15 through October 15. These two astounding venues offer some of the most dramatic scenery in the Western USA. Set off with your guide in a luxurious minivan and travel through the scenic Arizona Strip and Dixie National Forest to Zion. In the Park you will see the most amazing rock formations, created by millions of years of erosion of the limestone. Admire the colorful network of deep canyons, forested mesas, deserts, and sandstone cliffs that are amongst the highest in the world. The Park is also home to a wide variety of unique plant and animal communities. 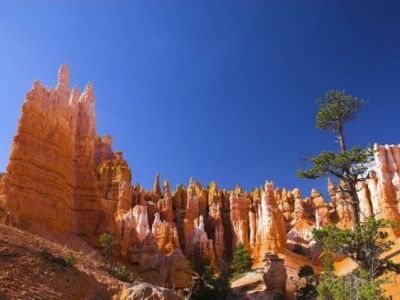 The tour then heads to Bryce Canyon, a surreal landscape of towering rock towers in different shapes. Learn about spires, fins, pinnacles and mazes that are known as Hoodoos. Take a tour around the visitor’s centre and explore the surrounding forests of ponderosa pines, fir and spruce trees. 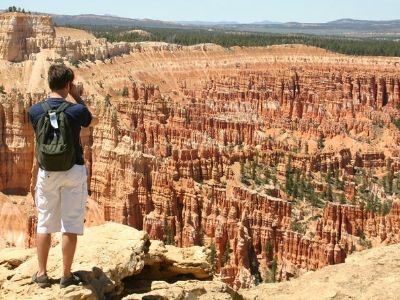 This Las Vegas to Bryce Canyon day trip will offer memories to last a lifetime as you look back on photos snapped during the tour. Calling all nature lovers and those who want to immerse themselves in the surreal beauty of nature. 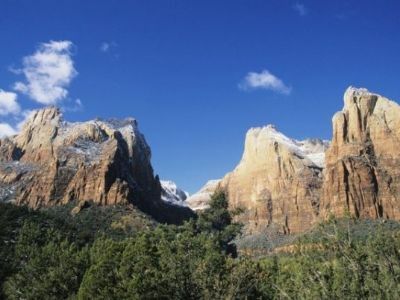 The 2 day Las Vegas to Bryce Canyon and Zion National Park Camping Tour is the perfect choice. Join this amazing 2 day tour and experience nature close up and personal. This tour is geared towards people who are fit, experienced in the outdoors and prepared to sleep under the stars! Set off with your professional guide in an air-conditioned minivan for a scenic 4 hour drive to Bryce Canyon National Park, towering at 8000 feet above sea level. Take a walk along the rim and be awed by the views of the natural amphitheater filled with towering red rock spires called Hoodoos. You will then hike down into the Canyon to see these amazing rock formations up close. The night is spent camping under the stars. Day 2 heads off to Zion National Park where you will be mesmerized by the massive red sandstone cliffs and the imposing canyon walls. For those who are really fit, take a hike along the rough trail on rocky rim ledges to Angels Landing. For the less fit, you can choose an easier walk that takes you to the magnificent Emerald Pools. Spend time in this incredible landscape and then set off back to Las Vegas. If camping under the stars is not for you, then the Las Vegas to Bryce Canyon and Zion National Park 2 Day Lodging Tour is a more comfortable choice! It will give you the same amazing experience but with the luxury of a proper bed and bath! Meet your guide at your hotel, get comfortable in an air-conditioned minivan and enjoy the scenery on a stunning 4 hour drive to Bryce Canyon National Park, towering at 8000 feet above sea level. Take a walk along the rim and be awed by the views of the natural amphitheater filled with towering red rock spires known as Hoodoos. You will then hike down into the Canyon to see these amazing rock formations up close. The night is spent at a pre-determined hotel. Day 2 heads off to Zion National Park where you will be mesmerized by the massive red sandstone cliffs and the imposing canyon walls. For those who are up for a challenge, take a hike along a rugged trail along the rocky canyon fin to Angels Landing. For the less fit, you can follow an easier walking trail that takes you to the magnificent Emerald Pools. Soak up the amazing atmosphere of this landscape and then set off back to Las Vegas. Plan an experience of a lifetime when you visit Las Vegas! 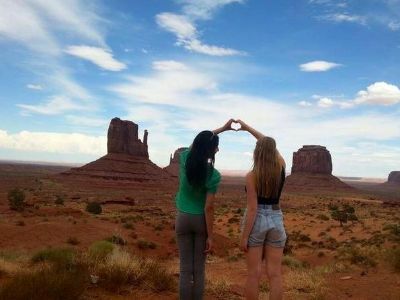 Join the Las Vegas to Bryce Canyon, Grand Canyon, Zion, Antelope Canyon, Lake Powell and Monument Valley – 3 Day Summer Tour, that takes you to see the most spectacular natural parks in USA. This 3 day tour is designed for a small group and you will be accompanied by a professional guide for the full duration of the trip. Day 1 sets off to Zion Canyon, an astounding natural landscape of white, pink and red Navajo sandstone cliffs. See the massive Virgin River that cuts through the towering cliffs, standing 2000 feet high on either side of the Canyon. This is a photographer’s dream, so make sure you have your camera ready! The tour will visit the lovely Emerald Pools, the Great White Throne, the Temple of Sinawava and Weeping Rock. You will also enjoy an entertaining talk at the Human History Museum given by one of the Park's rangers. Continue on to Bryce Canyon. This massive natural amphitheater was created by millions of years of erosion, forming incredible rock formations, towering cliffs, spires and slot canyons. When evening falls you will be treated to a BBQ around a camp fire before settling down under the stars. Day 2 sets off to Lake Powell and a visit to Antelope Canyon. The drive takes you through the spectacular scenery of the south west USA, featured in many famous movies. 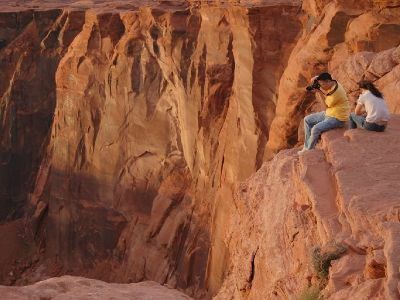 When you reach Monument Valley, you will be treated to a guided tour by a Navajo Guide. Get settled into a 4x4 Jeep and be prepared for a day of fun! You will camp on the rim and spend an evening gazing at the awe-inspiring night skies. Day 3 – after watching the sun rise over the Canyon, you will set off on another mind-blowing experience. Your destination is the sensational Grand Canyon. The drive follows the massive Colorado River through the Painted desert to the Canyon, one of the Seven Natural Wonders of the World. You can enhance your experience by taking a helicopter ride to see the Canyon from a bird’s eye view. You can choose to walk along the rim, take a more challenging hike into the depths or simply relax at the café and admire the views. All camping equipment and sandwich style lunches are included. This tour only operates in the summer months. If you have time to spare and want to appreciate the full beauty of the south west USA, we recommend the Las Vegas to Bryce Canyon, Grand Canyon and Zion National Park 3 Day Tour. The tour is led by a professional guide and accommodates 15 people on a luxury full-sized bus. Day 1 departs from the Luxor Hotel and travels through the scenic desert towards the Grand Canyon in Arizona. You will pass through the . authentic Navajo Indian Reservation as you head for the south bank of the Canyon. Your guide will update you on all you need to know about the history and geology of this stunning world wonder. After lunch, the tour stops at a traditional Native American market where you can browse wonderful handmade arts and crafts. Then it is off to Lake Powell, where you spend the night in the nearby town of Page. Day 2 offers a scrumptious breakfast and the delight of a cruise on the Lake. See the famous salt pillars, coves and learn about the amazing red sand arches. Your bus then crosses the border into Utah and enters the Bryce Canyon National Park. This Canyon is known for some of the most astounding natural rock formations in the world. Striking pillars, arches, slot canyons, towering cliffs and amphitheaters make up the landscape. Your guided tour will give you a deeper insight into the geology and formation of these structures. Snap photos from the look out points and then head to Kanab for your overnight stay. Day 3 of this Las Vegas to Bryce Canyon tour sets off to Zion Park and the massive Virgin River that cuts through it. Admire this surreal landscape of towering plateaus, rock towers, temples, mesas and a breathtaking tall sheer sandstone walls. Your guide will take you to visit the Angel's Landing, the Temple of Sinawava, the Great White Throne and Weeping Rock. Some of these attractions require a short hike, you can decide where you want to go. Spend time exploring and getting immersed in this astounding landscape. As evening falls, you will head back to Las Vegas on your tour bus. If you are staying in Los Angeles, you can join this amazing Las Vegas to Zion National Park, Horseshoe Bend and Bryce Canyon 3 Day Tour that travels to Las Vegas and then on to some of the most famous attractions in the USA. If you are in Las Vegas you can join the tour from there. Travellers who depart from Los Angeles will travel through the San Bernardino National Forest and then cross the fascinating Mojave Desert landscape known for its weird shaped Joshua trees. After arriving in Vegas, soak up some of the glitz and glamour before heading to St George. Day 2 - For travellers joining the tour in Las Vegas, you will enjoy a scenic drive to Lake Powell where you can take a boat tour to experience the Lake from the water. Next, it is off to Antelope Canyon, a unique landscape offering stunning photo opportunities of beautifully sculpted rock formations. Your next stop is Horse Shoe Bend, an awe-inspiring sight as the majestic Colorado River cuts through the rocky cliffs making a 270 degree U-turn. See the famous sparking blue-green water, blue sky and red rocks – a photographer's dream! Your overnight stay is in Bryce. 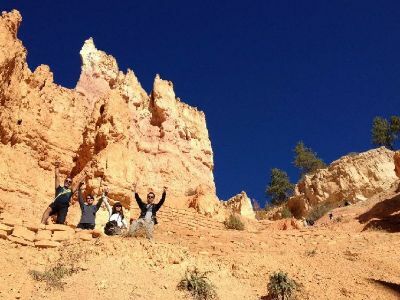 Day 3 sets off to Bryce Canyon National Park, offering panoramic views of bizarre rock formations, sandstone cliffs, towering spires and slot canyons. After spending the day here, the tour returns to the lights of Las Vegas. Camp under the stars, visit some of the most amazing natural landscapes in the USA and meet fabulous people? Interested? Then this Las Vegas to Bryce Canyon, Zion, Monument Valley And Grand Canyon 3 Day Camping Tour is for you! 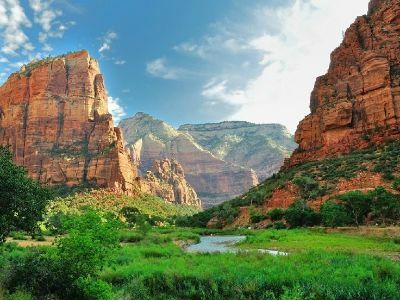 Day 1 sees you depart from Las Vegas, travelling in a comfortable air-conditioned minibus to Zion National Park, known for its spectacular sandstone cliffs that dazzle the eye in colors of white, pink and red. Depending on your level of fitness, you can take a relaxed walk to the stunning Emerald Pools or a more challenging hike to see the Weeping Rock or the Great White Throne. Learn more about this amazing place at the Human History Museum where local Park rangers will keep you entertained. 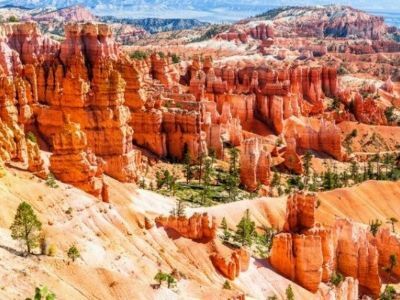 Your trip then heads to Bryce Canyon, a massive natural amphitheater that was created by millions of years of erosion, carving out its famous Hoodoos. These dramatic spires will take your breath away as you take a hike down into the Canyon to see them close up. Day 2 - after a night under the stars you set off on a scenic drive to Lake Powell. You can optionally visit Antelope Canyon at your own expense before arriving in Monument Valley, home to the Navajo Nation. A professional Navajo guide will take your group on a guided tour of the valley in a anthentic 4x4 Jeep - an unforgettable experience! Day 3 of this Las Vegas to Bryce Canyon trip sets off to the awe-inspiring Grand Canyon. You will first visit a traditional Navajo trading post and then follow the Colorado River through the Painted Desert to Grand Canyon National Park. Spend time walking along the South Rim, hike down into Canyon, take a helicopter ride or relax at the café and admire the panoramic views. All up to you. Head back to Las Vegas with amazing photos, new found friends and incredible memories. Join a fabulous tour that is all-inclusive, taking away the worry of having to lay out extra money that you had not budgeted for. Our Las Vegas to Bryce Canyon, Grand Canyon, and Zion Bus Tour – All-Inclusive 3 Day Tour departs from Las Vegas and travels in a luxurious minibus through the scenic desert and the Navajo Indian Reservation towards the Grand Canyon. Your knowledgeable guide will keep you entertained with interesting facts about the region, its history and amazing geology. The tour stops at the South Bank where you can spend time exploring this natural wonder of the world. After lunch you will head to the East Bank, stopping on the way at some traditional Indian market places where you browse and buy stunning handmade arts and crafts. Day 2 departs for the awe-inspiring Lake Powell. Take a boat cruise on the water and see the hidden coves, the magnificent salt pillars and the sand arches. Next, you are off west to Bryce Canyon. Here you will be astounded by the amazing natural rock sculptures created by millions of years of erosion. Rain, wind, sun and weather have honed the sandstone cliffs into spectacular shapes and colors that will leave you breathless. The Canyon looks even more spectacular at sunset and you will be there to experience it! Day 3 sets of this Las Vegas to Bryce Canyon sets off to Zion Park, which took its name from the Mormons who settled in the area. The towering mountains, silent wilderness and imposing cliffs will make you feel as though you have been taken to a wonderland not on this planet! Enjoy the beauty close up and enjoy a walk – there are trails to suit all fitness levels. Head back to Las Vegas with amazing pictures, new found friends and a refreshed sense of wonder. Enjoy this Las Vegas to Bryce Canyon, Grand Canyon and Zion National Park 3 Day Tour with an experienced guide and see the most amazing landscapes in the USA. Come back with a camera filled with photos and spectacular memories! The trip departs early from Las Vegas and heads to the Nevada Arizona border through the desert, an iconic venue captured in many famous movies. You will stop to explore the amazing Zion National Park, filled with sandstone cliffs that sparkle in colors of pink, white and red. 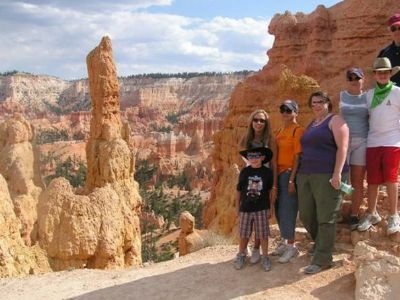 Continue to Bryce Canyon where you will learn all about the spectacular rock formations known as Hoodoos. Rain, wind, sun and weather have honed the sandstone cliffs into spectacular shapes that you won't find anywhere else on the planet. Travel on to Page, set on the shores of Lake Powell. This massive Lake is known as one of the most beautiful in the USA, with sparkling blue waters, surrounded by towering golden canyons. Stop at the Glen Canyon Dam Wall and peer over the sides into Canyon far below. 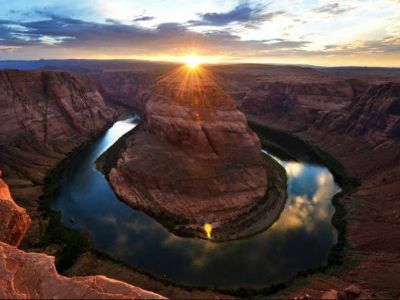 Your day ends at the awe-inspiring Horseshoe Bend, a amazing sight where the massive Colorado River makes a 270 degree turn through the towering cliffs. Day 2 sets off to Antelope Canyon where you will explore in a 4x4 Jeep with a Navajo guide. Learn how this unique slot canyon was created, travel into the depths, see the incredible palette of colors as the light filters down between the rocky crags. After this, you will continue through the scenic desert to Monument Valley. Under the guidance of a professional Navajo guide, you will explore in a Jeep. See the buttes, mesas and other sandstone formations that the valley is famous for. You can take a relaxed walk or a more challenger hike as you choose. On your drive to Page, you will stop at a traditional Indian Trading Post where you can browse handcrafted wares. Day 3 leaves the best for last! Set off the astounding Grand Canyon and stop at the Desert View Watchtower. Then head to Bright Angel Lodge where you can stroll around the Canyon, take pictures, admire the views, buy souvenirs, or enjoy a meal. Add some fun to your Las Vegas to Bryce Canyon trip and take a helicopter ride to see the Canyon from up high. On your way back to Las Vegas you will be able to see the Hoover Dam. The Las Vegas to Bryce Canyon, Antelope Canyon, Lake Powell and Grand Canyon West Rim 3 Day Tour offers a unique view of the Grand Canyon from the West Rim and is ideal for those travellers who have time to spare and see some of the world’s most astounding natural landscapes close up. Day 1 departs from Las Vegas in a luxury minivan under the guidance of a professional guide. Enjoy a scenic drive through the desert, the venue of many famous Western Movie settings! Head to the Zion National Park, known for its amazing soaring sandstone cliffs adorned with colors of white, pink, red and tan. Then visit Bryce Canyon, known for its towering amphitheater of magnificent red rock formations created by millions of years of erosion by wind, water and sun. These Hoodoos create a surreal effect and you need to snap some selfies with them in the background! Day 2 – after your night in Page the tour departs for the magnificent Lake Powell, a masterpiece of engineering. This is the second largest man-made reservoir in the USA and you can take an optional boat ride to experience the views from the water. Then travel to Antelope Canyon, known as a slot canyon, featuring amazing narrow rocky passageways and tall cliffs. See the surreal effects created when the sun filters through the rocks. Day 3 of this Las Vegas to Bryce Canyon tour starts with a visit to Hoover Dam, another awe-inspiring body of water. Then you travel through the Hualapai Indian Reservation and arrive at the West Rim of the Grand Canyon. If you are brave and have a head for heights, take a walk along the Grand Canyon Skywalk! You can also, at your own cost, take an airplane flight over the Canyon or try out a cruise along the Colorado River on a pontoon boat. Your trips returns to Las Vegas. Are you visiting in the winter? We have a special tour to shake off those winter blues! 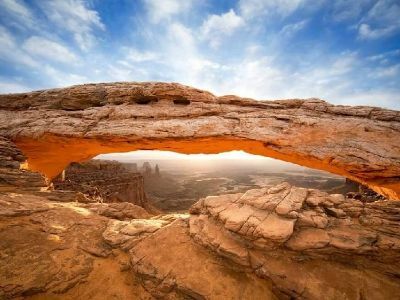 Set off on the Las Vegas to Bryce Canyon, Grand Canyon, Zion, Antelope Canyon, Lake Powell and Monument Valley, 3 Day Winter Tour with your guide in a luxurious minivan. Enjoy a scenic drive along the famous Route 66 through the Mojave Desert. Your destination is the Grand Canyon National Park South Rim, one of the Seven Natural Wonders of the World! On the way, the tour stops at the amazing Hoover Dam for you to take some photos. At the Canyon, you can choose to explore on the hiking trails, stroll along the rim, take a helicopter ride or relax at a café and admire the stunning views. Day 2 sees you travelling along the mighty Colorado River through the Painted Desert to Monument Valley. This is the setting of many iconic Western Movies, books and songs. On the way you will stop at a traditional Indian Trading Post and have time to browse for handcrafted gifts. Once in the Valley, you will be treated to a unique trip in a 4X4 Jeep, led by a Navajo guide. Your night is spent in the town of Page. Day 3 sets off early to the Zion National Park. Stop at the spectacular Horseshoe Bend, a stunning site seen from high up, where the massive Colorado River makes a 270 degree U-turn through the red rocky cliffs. The Las Vegas to Bryce Canyon tour also makes an optional stop at Antelope Canyon. Once in Zion Park, you will be awed by the white, red, pink and tan colors of the towering sandstone cliffs, formed by aeons of erosion. There are enchanting walks for all levels of fitness, explore on your own! Head for the Emerald Pools or take the less challenging Pa’rus trail. Don’t miss the Weeping Rock to the Great White Throne. This tour operates in Winter, see the corresponding tour if you are travelling in summer months. Our unforgettable Las Vegas to Bryce Canyon, Grand Canyon West, Horseshoe Bend, Zion National Park 5 Day Bus Tour departs from Los Angeles and meets up with travellers from Las Vegas. If you are departing from Los Angeles you will enjoy a scenic drive through the Mojave Desert to arrive in the glitzy and glam city of Las Vegas - The Pearl in the Desert. Your overnight stay is in St. George. Day 2 sets off on a scenic drive along the Colorado Plateau towards Lake Powell. This is America’s second largest man-made lake. You can enjoy a boat trip at your own expense. Next is a stop at Antelope Canyon, one of the top ten sites in the world for photographers! See the spectacular rocky canyons and cliffs. Then set off to Horseshoe Bend, a magnificent sight where the massive Colorado River forms a U-shape bend through the towering red cliffs. Your overnight stay is in Bryce. Day 3 takes you to Bryce Canyon National Park. This unique landscape has been formed over millions of years of erosion of the sandstone, creating spectacular rock amphitheaters, windows, fins and spires, known as Hoodoos. 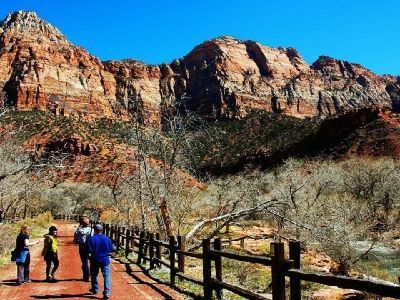 After lunch your tour travels to Zion National Park where you will be amazed by the white, red, pink and tan colors of the towering sandstone cliffs. Relax on the bus and soak up the scenery as you travel through the state of Arizona, passing Virgin River Canyon to Las Vegas. Day 4 leaves the best for last. Travel to the magnificent Grand Canyon National Park, one of the Seven Natural Wonders of the World. You can walk on the glass Skyway Bridge – only for the brave – or take a helicopter ride. You can stroll around and then relax at a café and soak up the amazing ambiance of this surreal landscape. For more thrills, the bus next stops at the massive Hoover Dam, a man-made marvel. Snap some photos and then get set to return to Las Vegas. Day 5 is for sweet lovers. Your tour Las Vegas to Bryce Canyon takes you to the Ethel M Chocolate Factory where you can learn how chocolates are made and sample some delectable gourmet treats. Then relax and meander through the maze of paths at the Botanical Cactus Gardens. After a buffet lunch, travellers from Los Angeles will depart, saying your goodbyes to new found friends! A stop will be made at the famous Tanger Outlets Barstow where you will be able to get your fill of some retail therapy. Enjoy this fabulous Las Vegas to Bryce Canyon, Yellowstone Park, Lake Powell 5 Day Trip with the family that will make lifetime memories! The tour departs from Los Angeles and meets up with travellers from Las Vegas. If you are departing from Los Angeles you will enjoy a scenic drive through the Mojave Desert to arrive in the glitzy and glamorous 'Pearl in the Desert' – Las Vegas. Day 2 sets off to Antelope Canyon, passing by Glen Canyon, where you will see the amazing Lake Powell. Lake Powell is the USA's second largest man-made lake and offers glittering blue water surrounded by towering canyons. Take in this stunning view and snap some photos! You can explore Antelope Canyon before setting off to Bryce Canyon National Park. Here you will see the unique rock formations called Hoodoos. These red-orange towering formations were created over millions of years of erosion, forming spectacular shapes. See the amphitheater that is filled by pinnacles, tall thin spires and mesas and learn all about the geology from your knowledgeable guide. Your overnight stay is in Salt Lake City. 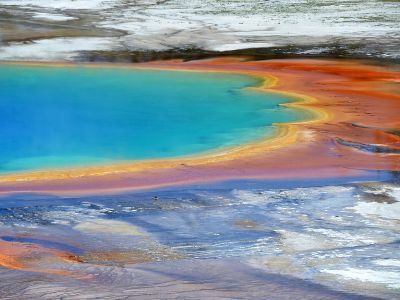 Day 3 visits the Yellowstone National Park, home to more than 10,000 geothermal features. Be awed at the landscape of snowy mountains, lakes, rivers, waterfalls, canyons and meadows. Look out for herds of elk and buffalo. Learn about geysers, hot springs, fumaroles and mud pots! The night is spent in the Park. Day 4 of this Las Vegas to Bryce Canyon trip allows you more time to soak up the ambiance of Yellowstone before setting off to follow the Snake River to Grand Teton National Park. You will travel to Jackson, a town known for its Cowboys! Ride on the Scenic Chairlift to the mountain top 10000 feet high and see a bird’s eye view over Jackson and the desert. Day 5 visits interesting sights in Salt Lake City. See the Temple Square and the Salt Lake Mormon Temple. Travellers from Los Angeles will depart, saying your goodbyes to new found friends and travellers from Las Vegas will return to Vegas. Do you have time to spare? This mega Las Vegas to Bryce Canyon, Zion National Park, Horseshoe Bend, Grand Canyon West 6 Day Tour departs from Los Angeles and also picks up travellers from Las Vegas. You will get to see some of the most stunning natural landscapes in the western USA, creating an experience that will last for a lifetime. Travellers from Los Angeles will depart and drive through the San Bernardino National Forest, the Mojave Desert and make a brief stop in Sin City to take in the razzle and dazzle. The night is spent in St. George. Day 2 sets off to Lake Powell, an amazing man-made lake where you can enjoy an optional boat cruise on the water. See the stunning scenery of blue water surrounded by towering cliffs. Your next stop is Antelope Canyon, a natural phenomena carved out by erosion over millions of years. Then see the awe-inspiring Horseshoe Bend, a magnificent sight of the massive Colorado River making a 270 degree turn around rocky cliffs. Your last stop for the day is Glen Canyon Dam. Day 3 heads to Bryce Canyon National Park. Here you will see the unique rock formations called Hoodoos. These red-orange towering formations were created over millions of years of erosion, forming spectacular shapes. See the amphitheater that is made up of pinnacles, mesas and tall spires, learn all about the geology from your knowledgeable guide. After lunch, head to Zion National Park, a rich tapestry of colored sandstone cliffs. Your drive takes you back to the lights of Las Vegas where you will spend a night on the famous strip. Day 4 is back to nature with a trip to one of the Seven Wonders of the World – the majestic Grand Canyon. On the way you will be treated to a stop at Hoover Dam which overlooks Lake Mead. Your stop at the West Rim of the Canyon offers magnificent views. Be brave and walk on the all-glass Skywalk or take a helicopter ride to see the Canyon from above. Day 5 is fun for those with a sweet tooth. At the Ethel M Chocolate Factory you will learn all about how chocolate is made and have time to sample as many delectable treats as you can before feeling ill. Then, work it off by strolling around the relaxing Botanical Cactus Garden. Los Angeles travellers will depart and head home, stopping at the Tanger Outlets in Barstow for some shopping on the way. Day 6 offers a choice of excursions. You can select from one of the following - Disneyland / California Adventure Park with no tour guide, Disney's California Adventure Park, Universal Studios Hollywood, Los Angeles City Tour, Palm Springs Outlet Shopping, Aquarium of the Pacific and Whale Watching. Ask us for more detailed information on these excursions. The Las Vegas to Bryce Canyon, Arches, Lake Powell 7 Day Grand Circle Tour departs from Los Angeles and meets up with additional travellers in Las Vegas. Day 1 is reserved for driving from Los Angeles to Vegas. Day 2 is the start of the fun with a drive in your luxury bus to the amazing Grand Canyon, one of the Seven Wonders of the World. You will spend the day here, exploring and soaking up the atmosphere of this incredible venue. See the views from the lookout points, take a helicopter tour at your own expense. Then watch the Grand Canyon IMAX film. Your overnight stay is in Page. Day 3 heads to Horseshoe Bend as a first stop. See the massive Colorado River make a 270 degree U-turn around massive rocky cliffs - it is an astounding sight. Your next stop is Lake Powell, the second-largest artificial lake in the USA. Take a cruise on a boat and be awed by the towering canyons that border the lake. 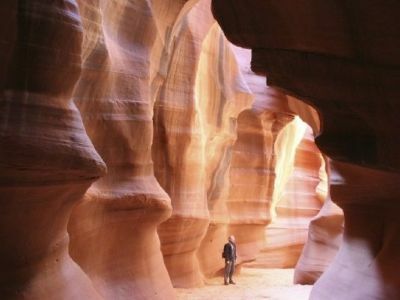 Drive on to Antelope Canyon where you will see stunning natural sandstone creations in hues of white, pink, red and tan. You can take an optional tour in a Jeep led by a Navajo Native American Guide. Your overnight stay is in Bryce. Day 4 sees you visiting the incredible Bryce Canyon National Park. Here you will see the unique rock formations called Hoodoos. These red-orange towering formations were created over millions of years of erosion, forming spectacular shapes. See the amphitheater that is filled by pinnacles, arches, spires, bridges and mesas and learn all about the geology from your knowledgeable guide. 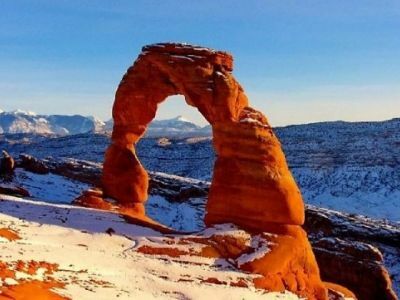 For more excitement, you travel to Arches National Park, a destination with more than 2,000 natural sandstone arches including the famous Delicate Arch. Day 5 – after a night in Green River you depart for Monument Valley. This unique landscape offers magnificent colors, miles of mesas, buttes and pinnacles. Explore on your own or join a 4x4 Jeep tour led by a Navajo guide. Don't miss the special Indian BBQ at your own expense. Day 6 heads to Sedona where you will have a fabulous experience walking on a surreal landscape of red rocks. Explore the Walnut Canyon National Monument, take the steps down to the Island Trail or a walk along the Rim Trail. Your overnight stay is in the glitzy city of Las Vegas. Enjoy a night show, stroll along the strip and rub shoulders with the jet setters! Day 7 is allocated for travellers returning to Los Angeles. Say your goodbyes to new found friends and depart with memories to last a lifetime. Want to visit iconic World Heritage Sites and explore Mother Nature with like-minded people? Join our stunning Las Vegas to Bryce Canyon and National Parks 7 Day Lodging Tour to see some of the most fascinating landscapes in the USA. Day 1 departs from the glitz and glamour of Las Vegas and heads into the desert towards Zion National Park. Settle down in your luxury minibus and learn all about the region from your knowledgeable guide. In the Park you be awed by the massive canyon walls and red sandstone cliffs. 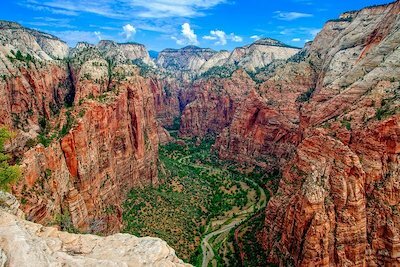 For those who are fit, take the challenge and hike along the ridge line to Angels Landing. For a less stressful experience, walk to the beautiful Emerald pools or enjoy a river stroll. Day 2 takes you to the spectacular Bryce Canyon National Park. Set at 8000 feet above sea level, it offers magnificent views of unique sandstone formations known as Hoodoos. These tall spires were created by millions of years of erosion by wind, water and sun. Take a walk down into the canyon and be awed by the towering towering cliffs, unique colors and the formation of the natural amphitheater. Day 3 heads spends more time in Bryce where you can take a guided sunset hummer tour, rappel down a cliff, or just relax and admire the views. Back in the bus, settle down for a drive to Arches National Park, home to over 2000 arches. 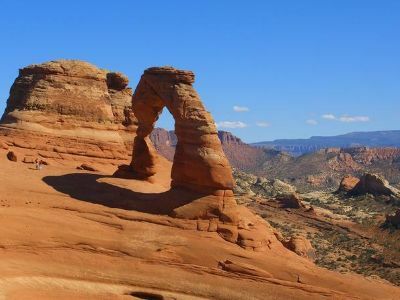 Join a light hike up to Delicate Arch. Day 4 visits the Canyonlands National Park where the Green River meets the Colorado, offering spectacular scenery. Learn about the story of Butch Cassidy and the Sun-dance Kid who used these very canyons to hide from the law! Day 5 of your Las Vegas to Bryce Canyon trip heads south to the iconic Monument Valley. This region has featured in many famous movies and is home to the Navajo Indians. Enjoy a once-in-a-lifetime experience when you ride in a 4X4 Jeep with a local Navajo guide. Day 6 leaves the best for last! Head to the awe-inspiring Grand Canyon. Your bus will stop on the way at an authentic Navajo trading post where you can browse for authentic Navajo arts and crafts. Your route follows the majestic Colorado River through the Painted Desert to one of the Seven Natural Wonders of the World! Stroll along the rim, take a helicopter ride, relax in a café and admire the views. The surroundings are surreal and beautiful and will take a while to absorb. Day 7 travels back to Sin City along the iconic Route 66. Soak up the razzle and dazzle of Las Vegas, shop up a storm, enjoy the restaurants and the vibe. Mingle with the jet setters and relax at the sparkling poolside. Then, head out for a night on the strip. Do you have a family or group of friends who love the outdoors and are fit? Our Las Vegas to Bryce Canyon, Yellowstone National Park, Grand Teton Small Group Camping and Walking 7 Day Tour is the perfect choice to see world famous landscapes, soak up nature and camp under the stars. It is designed for a small group of maximum 14 people and is led by a knowledgeable and professional guide. Day 1 sets off on a scenic drive through Cedar Breaks heading for the spectacular Bryce Canyon National Park. Enjoy a picnic lunch sitting o the rim and then spend the day exploring. You can take an easy walk along the rim. You can get more ambitious and hike into the Canyon to get close to the awe-inspiring Hoodoos, towering rock spires created by millions of years of erosion. Then visit the Visitor’s Center and listen to an inspiring talk by one of the Park's rangers. Your first evening sets the scene, camp out under the stars, relax around a fire and enjoy a BBQ dinner! Day 2 travels north to Salt Lake City, the home of the famous Tabernacle Choir. Learn about Mormon Pioneer history, see the State Capital Building and visit the Salt Lake Mormon Temple. Day 3 heads to the scenic landscape of the Grand Teton National Park. Enjoy the extraordinary wildlife, pristine lakes and alpine terrain. Hike along some of the trails to explore this unique region. 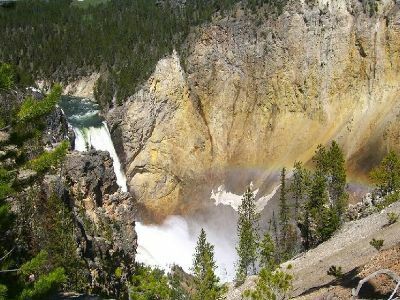 Day 4 and 5 - You will visit the famous Yellowstone National Park, the jewel of Parks. This mountain region is home to grizzly bears, wolves, herds of bison and elk. Most of the world's natural geysers are located here, making this a unique experience. You will spend 2 days exploring here. Make sure you are prepared to get wet in the hot springs. Day 6 brings you closer to the grizzly bear when you enjoy a tour of the Yellowstone Grizzly Bear and Wolf Discovery Center. After lunch you travel to see more Canyons in the Provo Lake Region. Admire the panoramic views of the Rockies, enjoy scenic walks and settle down for your last night under the stars. Day 7 heads back to Las Vegas with a stop at the beautiful Snow Canyon state park to see remains of ancient lava flows and the imposing red Navajo sandstone. Back from Las Vegas to Bryce Canyon trip, if you are up to it – enjoy the glitz and glamour of the strip. Experience a full week of exploring the most amazing National Parks in western USA. The Las Vegas to Bryce Canyon, Zion, Grand Canyon South Rim and Monument Valley 7 Day Trip is a perfect choice. Set off from Las Vegas in an air-conditioned minivan with your knowledgeable guide. Your first leg of the tour heads across the border into Utah to the the Zion National Park. Here you can see the massive canyon walls and red sandstone cliffs set against a brilliant blue sky. 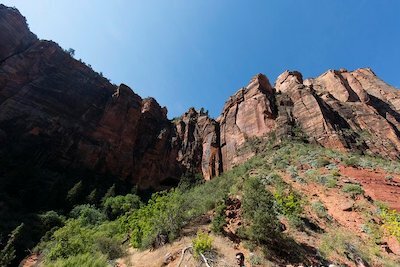 Depending on your level of fitness you can choose to take a challenging hike along the ridge-line to Angels Landing, or a relaxed walk to the Emerald Pools. Be awed by the beautiful scenery of waterfalls, cliffs and canyons. Visit the Temple of Sinawava, Weeping Rock and the Great White Throne. Day 2 takes you on a drive to Bryce Canyon National Park. This incredible landscape is known for its towering sculpted rock formations, called Hoodoos. You can stay on the top of the Canyon to admire the views or hike down to get a closer look at these surreal rock creations. Day 3 and 4 takes you to Arches and Canyonlands National Park. Arches is a unique landscape, home to over 2000 natural stone arches. Hike up to Delicate Arch, the iconic freestanding natural arch at 65 feet tall. Then head to Canyonlands National Park, crossed by the massive Colorado and Green Rivers. These canyons were used by the famous Butch Cassidy and the Sundance Kid when they escaped from the law. You can enhance your experience with an optional sunset Hummer tour or perhaps try your hand at canyoneering to explore the sandstone cliffs. Day 5 – your tour passes the magnificent Lake Powell to arrive at the iconic Monument Valley. Featured in many movies, this astounding landscape is known for its dramatic rock formations that tower into the sky. Take a guided 4x4 Jeep tour with a Navajo guide to learn all about the history and geology of the region. Night time offers a spectacular view of the starry guide, far from the city lights. Days 6 sets off to do some browsing at a traditional Navajo trading post. You can take an optional visit to Antelope Canyon, the world's most famous slot canyon. Or, you can take a walk to see the awe-inspiring Horseshoe Bend. Your tour then heads to the grand finale – the Grand Canyon. The road follows the massive Colorado River as it winds through the Painted Desert and you will feel the excitement mount. This Las Vegas to Bryce Canyon trip stops at the South Rim, where you can admire the spectacular scenery, stroll around or take a hike into the depths of the Canyon. To make the experience even more amazing, take a helicopter ride to see the Canyon from up high. Day 7 - head back to Las Vegas with your new found friends and memories to last a lifetime.